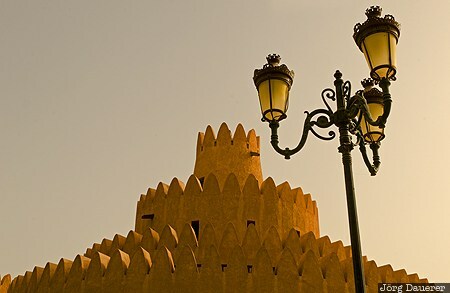 A tower of the Al Ain Palace Museum (which is also known as Sheikh Zayed Palace Museum) illuminated by warm morning light with a street lamp in the foreground. Al-Ain is the second largest city in the Emirate of Abu Dhabi, United Arab Emirates (UAE). This photo was taken in the morning of a sunny day in March of 2012. This photo was taken with a digital camera.